EC executive chairman Andrew Mangion (fourth from left) after receiving the award, accompanied by (from left) marketing director Ricky Sharma, young learners director Charlie Tweddle, regional sales director – MENART Robin Garforth, global sales director Fernando Aguilar and regional sales director – Europe Katya Bonello. EC English Language Centres has once again won the coveted ST Star Chain School Award, one of the most sought-after accolades in the study/travel industry. This is the third year in a row that EC has taken the prize, and the school’s fourth win of the prestigious award. The ST Star Awards recognise and honour language schools that consistently deliver quality service to their students and partners, thereby raising the standards of all schools across the industry. This is the 14th year for the awards, and shortlisted nominees vied for the top spot in 25 categories. Winners are chosen by votes from hundreds of specialists, consultants and professionals who hold years of experience and insight in the business. 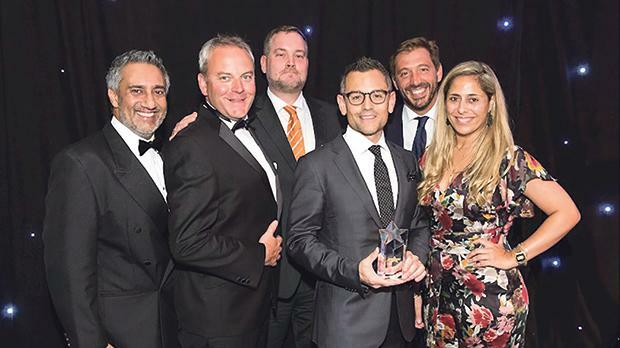 The winners of the highly-respected awards were announced on September 1 at a glittering awards ceremony held at Grosvenor House, AJW Marriott Hotel in London. Nearly 1,200 professionals, delegates and guests from the industry were in attendance to celebrate the event. EC won the ST Star Chain School Award in 2017, 2016 and in 2011, and has been nominated for the award almost every year since 2007.